VANCOUVER, BC (January 16, 2017): Ladurée, the world-renowned luxury French pâtisserie, celebrates Chinese New Year on January 28th, with beautifully designed limited edition macaron boxes, available at the Vancouver Boutique and Tea Salon while stocks last. 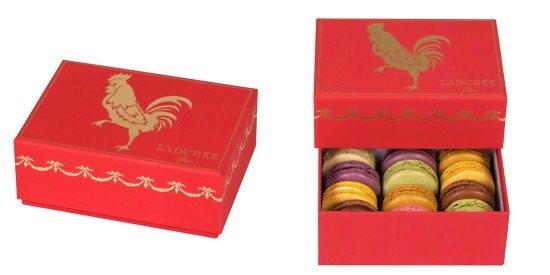 Available in the lucky colour red, the limited edition Chinese New Year macaron boxes feature a golden rooster to celebrate the start of the Year of the Rooster. Taking a step away from Ladurée’s usual soft palette of pastels, the rich red and golden box makes a majestic and proud momento for macaron lovers this Chinese New Year. The Chinese New Year limited edition boxes are available in red and each contains 12 assorted macarons ($53). Ladurée is located at 1141 Robson Street, Vancouver, BC, open seven days a week, 10am to 9pm. For more information, visit www.laduree.com, or follow on Instagram: @ladureecanada / #ladureecanada #ladureevancouver, or on Facebook: facebook.com/LadureeCanada.